The prototype Skeeter helicopter was designed by the Cievra Autogyro Company as the W14 Skeeter 1 with a 106hp Jameson FF-1 engine and first flew on 8 October 1948 (G-AJCJ), but early development aircraft were under-powered and suffered from resonance problems. The Skeeter had a small, steel tube fuselage structure with a semi-monocoque tail boom section. The three-blade main rotor had metal spars with wooden ribs and a fabric skin, and the two-blade tail rotor was entirely of wood. All the aircraft had tricycle landing gear, although some tests were done with skids. A second machine, the Skeeter 2 G-ALUF, was flown on October 20th, 1949, in which the most important of several design changes were the employment of a 145hp Gipsy Major 10 engine, increased rotor diameter and a slightly longer tailboom of circular instead of triangular cross-section. Two further-modified Skeeter 3's were begun by Cierva which were completed by Saro, for evaluation by the Ministry of Supply, after the latter company had acquired Cierva in January 1951. Two Mk. 3 (Gipsy Major 10) and one Mk. 4 (Bombardier 702) were constructed for Ministry of Supply evaluation. The two Mk. 3's were later fitted with Bombardier engines, and re-designated Mk. 3B. One similar machine was completed as the Skeeter 4. During 1960 a new skid undercarriage was adopted on the Skeeter for the British Army in place of the wheels previously fitted. 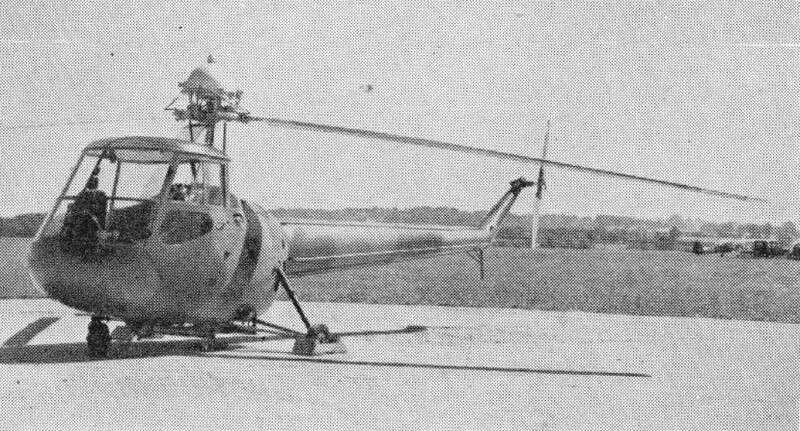 Saro's two Skeeter 5 prototypes, built as a private venture, was essentially similar apart from instruments and minor controls such as the positioning of the rotor brake, they differed in detail from the prototype Mark 2 Skeeter. The Mark 5 has a 190 b.h.p. Blackburn Cirrus Bombardier 704 engine, while the Mark 3 has a 180 b.h.p. Bombardier 702. The engine is fan-cooled with a belt drive. They were the first machines of the series to be really free of the ground resonance problems which had beset the earlier prototypes. In 1956 the Skeeter 5's were refitted with 200hp Gipsy Major 201's. In its civil form, the Skeeter Mark 5 has a 27-gallon fuel tank, which gives an endurance of about three hours, and a further 11 gallons may be carried in an auxiliary tank. The rotor and control system are simple with the three blades being built-up on tubular steel spars, with ply ribs and fabric-covering. Each blade weighs in the region of 45 lb. 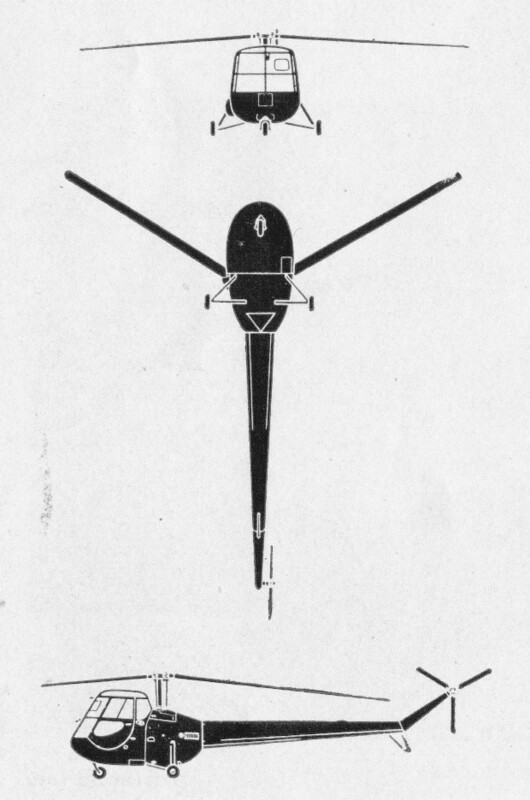 The tail-rotor of the Mark 3 differed from that of the Mark 5 in having only two blades. The government-sponsored Skeeter 6 had a 149kW Gipsy Major 30. The power of these engines is much the same but the latter version is a little heavier, carrying more payload and having a higher cruising speed. The Skeeter is built up from four sections-the tail cone, complete with rotor, the rear all-metal fuselage boom, the centre-section, complete with engine, and the cockpit. This seats two side-by-side with full dual control and instrumenta-tion. The Skeeter Mk.6 made overseas appearances at Paris and Stuttgart in June 1956. After pre-service trials with the Skeeter 6 prototypes, initial production orders were given for two basically similar versions with the Gipsy Major 200 engine. These were the four Skeeter 6A, ordered for the Army Air Corps as the AOP Mk.10, and one Skeeter 6B as the T Mk.11 dual-control trainer for the RAF. Follow-on orders were placed later for the Skeeter 7A (AOP Mk.12) and 7B (T Mk.13), which differed chiefly in having 215hp Gipsy Major 215 engines. The Skeeter 7 was also the subject of a small export order, the Federal German Army and Navy ordering eleven and four as Mk.50 and Mk.51 respectively. Final variant was the Skeeter 8, basically an adaptation of the 7 for commercial operation. Three were built for C. of A. tests, but no civil orders ensued and Skeeter production came to an end in 1960 (by which time Saunders-Roe had become part of the Westland group) after a total of seventy-seven aircraft had been built. The Skeeter was the first helicopter to enter British Army Air Corps service, replacing fixed-wing Auster aircraft. The definitive military version was the AOP12 and deliveries began in June 1958. In the three years this version was in production a total of 64 were built in three separate batches. 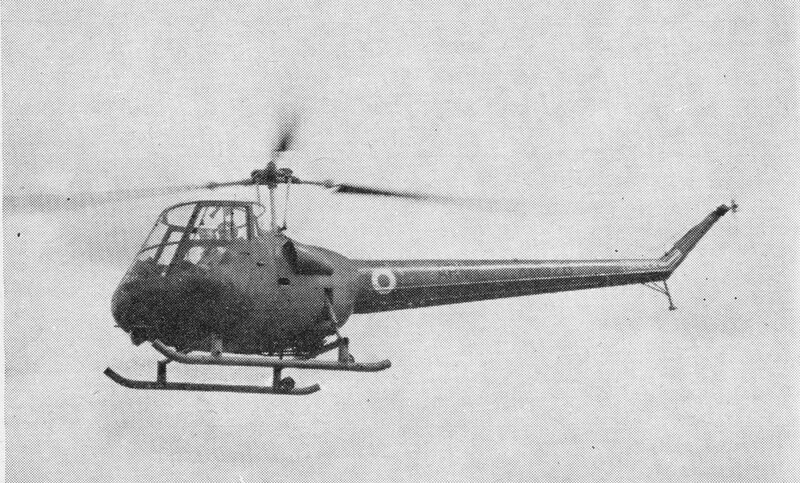 The Saro Skeeter AOP 12 was a two-seat reconnaissance and artillery-observation-post light helicopter which served with the British Army Air Corps between 1957 and 1967. It was powered by a de Havilland Gipsy Major Type 140 piston engine, delivering 215 bhp at 2850 rpm. It had a cruising speed of 76 knots, a service ceiling of 12800 feet and a range of 160 nautical miles. In 1957 a small number of Skeeter AOP 10s were delivered to the Army and a T.11 to the RAF and about 50 AOP 12s and T13s were delivered in 1959. A small number of Skeeters, designated Marks 50 and 51, served in Germany. The German Army and Navy received six and four respectively, which were transferred to the Portuguese Air Force in 1961 but never flown. 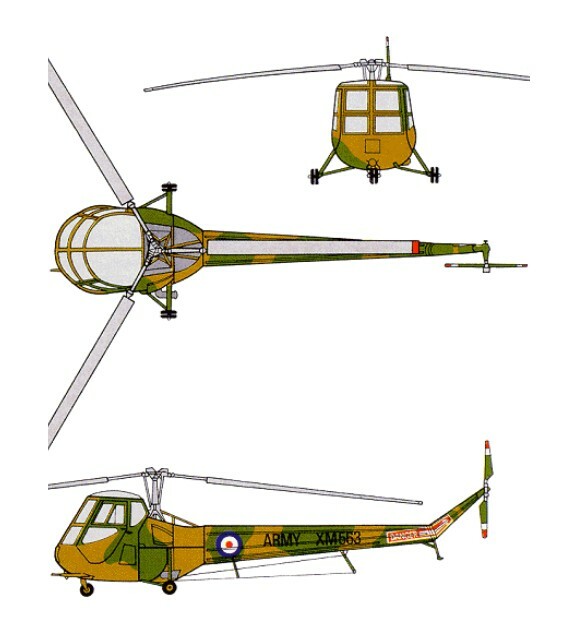 Of the fifty or so Skeeters supplied to the British services, the AOP 12's served mostly at the Army Air Corps Training School, while the RAF T13's were allocated to the Central Flying School and to No.651 Squadron. Ten of the German Skeeters were handed over in July 1961 to the Forca Aerea Portuguesa, with whom they were still in service in 1968. Dual controls are fitted as standard in all Skeeters. During their early life various Skeeter prototypes were used to flight-test a supercharged Gipsy Major engine, a Blackburn Turmo shaft turbine, and a Napier rocket-powered tip-drive system. With only a single crewman aboard, the Skeeter could be flown in a casualty evacuation role with a stretcher pannier supported on each side of the cabin. 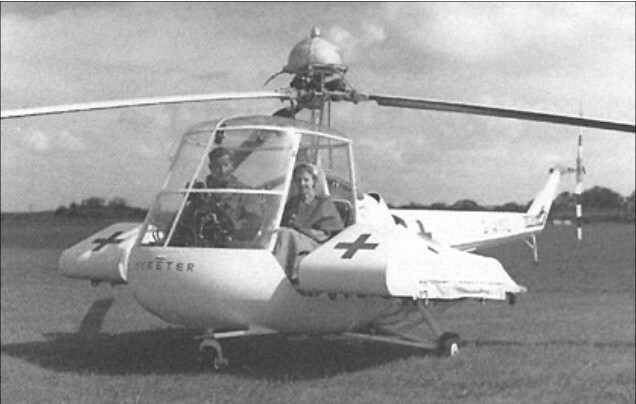 Most Skeeters were replaced by Scout helicopters in 1967 and 1968 having served with four Army Air Corps Squadrons. Engine: Gipsy Major 30, 186 h.p.